Those across the pond have already seen the start of the third season of Ricky Gervais' An Idiot Abroad, and while those of us in the U.S. have to wait for Season 3 to make its debut here, on the bright side, Science has confirmed that they will be premiering the third season of the show early next year. And we have the episode descriptions for the three installments. An Idiot Abroad is an unscripted travel series that follows Gervais' pal Karl Pilkington as he treks across the globe, reluctantly having adventures, meeting the locals, trying foods and complaining about things that bother him. Science doesn't actually title Season 3, The Short Way Round in their announcement, as it's titled on Sky1. The subtitle is likely a nod to Pilkington's travel companion in the new season (if not the briefness of the season, which only consists of 3 episodes). Joining him on his adventures is Life's Too Short star Warwick Davis (of Willow and the Harry Potter movies). 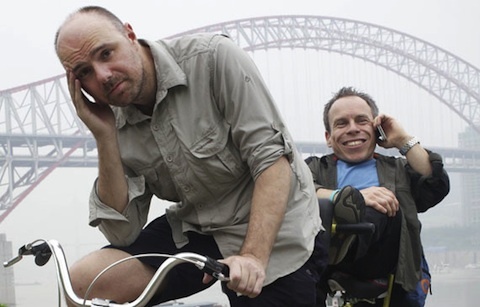 Season 3 will have Pilkington and Davis following in the footsteps of Marco Polo, traveling from Italy to China. It's going to be very interesting to see what kind of dynamic Davis and Pilkington have as travel companions. Given Karl's nerves, perhaps having a partner with him throughout his trip will help boost his spirits. Or else, maybe Warwick will give Karl something new to complain about. Season 3, which has already begun airing in the U.K., will premiere Saturday, January 19 at 9:00 p.m. ET/PT on Science Channel. For those of you who want a few more details about what's ahead, below are the episode descriptions, beginning with Karl and Warwick's visit to Venice, Italy. Ticket for two please; Karl Pilkington's got company for his latest adventure. The prospect of “holidaying” with Warwick doesn't fill Karl with joy, but, regardless, Ricky sends the pair off to their first pit-stop: Venice, Italy. Nerves are tested when Warwick takes Karl to a masked ball, where they enter the inaccurately-named Pleasure Machine, before Karl moves on to his wish-list, test-riding a jet-pack. Things don't go to plan and, with Warwick proving less than sympathetic, Karl gets his own back with the help of some balloons. It's time to hit the road as Karl and Warwick's journey continues via India, one of Karl's least favorite destinations from his previous travels. To get Karl in the right frame of mind to appreciate the country properly, Warwick introduces Karl to laughing yoga, before they land roles in a Bollywood movie. This may be Warwick's area of expertise, but Karl embraces the opportunity to showcase his natural rhythm. It’s the final leg of the journey and Karl and Warwick’s relationship is tested to the limit as they prepare to make their way to China. First there are a few loose ends to tie up in India – Karl has some unfinished business with the Spider Sisters that Warwick gets dragged into. With tensions running high, the duo arrives in the Far East where Ricky has arranged a couple of eye-opening excursions, including a (short-lived) cruise along the river Yangtzi, and some quality time with a panda at the Sichuan Panda Sanctuary.